(Phys.org)—While it may look like researchers from Tsinghua University in Beijing are sketching out an idea for a circuit on a piece of paper, they're actually using a special pen that draws real circuits using carbon-nanotube-based ink. This technique, called "fiber drawing," has previously been used to construct patterns, but the fiber length is usually very short at just a few millimeters, and the drawing speed is typically very slow. These drawbacks limit its use in circuit fabrication. In the new study, the researchers demonstrated that their new pen can draw carbon nanotube fibers that are more than a half of a meter long with fast drawing speeds of up to 10 cm/second. Their work is published in a recent issue of Nano Letters. Due to the nanotube fibers' high conductivity and excellent mechanical flexibility, the researchers predict that the fibers could serve as the fundamental building blocks for a wide variety of flexible electronic devices, such as wearable electronics, flexible touch displays, flexible solar cells, RFIDs, and 3D devices. 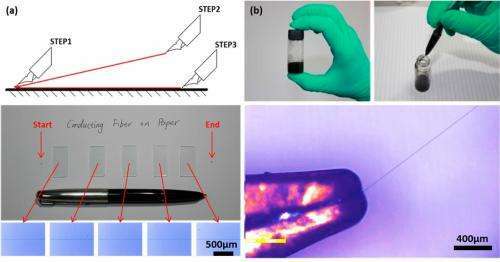 While the pen itself is an ordinary commercial pen, the ink consists of a combination of electrically conductive carbon nanotube fibers and a viscous polymer solution called polyethylene oxide (PEO). The viscous PEO is highly elastic and mechanically strong, which allows it to pull long nanotube fibers from the solution during the writing process. "The drawing technique allow us to achieve very long carbon nanotube fibers mainly due to the high molecular weight of the polymer and high viscosity of the precursor solution as ink," coauthor Hui Wu, Associate Professor at Tsinghua University, told Phys.org. 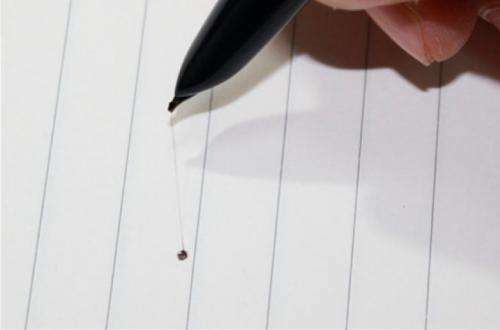 When writing, the pen is lifted off the paper to stretch and suspend the fibers, which can then be laid down on the substrate in the desired position. The researchers demonstrated that complex fiber patterns can be drawn by hand, and they predict that even greater precision can be achieved using advanced mechanical devices. The researchers also showed that increasing the polymer concentration of the ink increases the diameter of the nanotube fibers from 300 nm to 3 µm. In general, thinner fibers have better conductivity than thicker ones due to their better fiber orientation. Tests show that the highly conductive carbon nanotube fibers also exhibit excellent mechanical flexibility. At first, the researchers expected that the ultralong carbon nanotube fibers should maintain their conductivity after bending and distortion. Somewhat surprisingly, their tests showed that the fibers actually exhibit an increase in conductivity after bending—about a 30% increase after 1000 bending cycles. 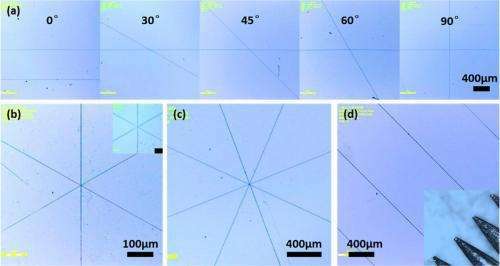 The researchers propose that the stress caused by bending deforms the polymers and improves nanotube alignment, which in turn increases conductivity. In the future, the researchers hope to expand the drawing technique to use different types of ink for different purposes. "We are now working on enabling more functions in the fiber," Wu said. "For example, one possibility is semiconducting fibers drawn from a pen tip for flexible device applications." Love the idea of very long Cnanotubes out of a simple store bought pen! This is generating half meter long fibers and that is a very arbitrary number. What is to stop this same pen from being modified in a factory setting to a type of machine fed 'plotter pen' that is guided by computer or mechanics to draw a continuous line on a substrate sheet fed from a roller like a printing press at high speed. Use many pens to do this in parallel. Farther down, dried as part oft the continuous process the many long nanotube fibers can be 'lifted' from the substrate and braided and woven into a nanotube cable collected on a drum while the substrate goes back onto a collection roll or just recycled back to the beginning of the process to begin anew. The end is a very long cable. If thin enough, many miles of nanotube cable can be stored on that drum; perhaps thousands of miles of very thin tape. Launch to space to geosynch orbit and pay tape out with weight at each end to make elevator. The first ribbon/cable from earth to space will be self supporting and serve as a base to add more ribbons, as the counterweight and the long length will support the weight of first small climbers and then larger climbers, each adding and bonding a new ribbon to the cable. The climbers each carry another reel of carbon nanotube tape. They start at the bottom and bond new tape all way, 60,000 kilometers to the counter weight and become one with the counterweight so that now the cable can carry that much more weight. Repeat this process many times till allowable climber weight is 30 tonnes. Add securement to the bottom at each step in the buildup process at the spaceport. Foundation and ultimate securement to be built first so cannot be dragged out of the ground. At first use it for cargo till it proves itself, but ultimately it will be the best, if slow, and cheapest way to space. Nuclear or solar as power to climbers. Cost to go maybe low as $10/pound amortized. Cable assembly process can be made scalable as to cross section of new bonded fiber cable so that the end result is thicker in the middle, the point of maximum cable stress which would be at the geosynchronous orbital station. That orbital station can be added to, the original station is a hub that serves as a giant wheel bearing for a large wheel like spacestation structure that rotates at a speed to make the outward forces at the floors of the wheel section about one gravitational unit. The diameter of the wheel could be about a kilometer so angular velocity would not be felt by workers on the station. Make the station about 20 decks with outer hull resistant to space junk, like a double or triple hull with viscous filler to autoseal holes. Large enough diameter station wheel will make angular velocity at the hub (the original station) slow enough so that stepping off the spoke elevators to the zero gravity hub would be 'uneventful' and vice versa. Osiris1: I think the space cable itself has still many issues before it can be made reality. One that came to me straight away was the high conductivity. Such a cable would be a huge lightning collector resulting into big electrical currents flowing through it. Just managing those could make this a no-go. Probably biggest issue for commercial uses will be the price of the ink. If it is cheap enough, then it might find uses in industry. Also the resulting conductivity is important. Too low and we will keep using metals for conductors. this should go up on fountainpennetwork. People could argue over weather the pen is a Parker or a Jinhao. Not who's read more Arthur C. Clark. And anyway, graphine ribbons hold more promise for the big elevator. Love the idea of very long Cnanotubes out of a simple store bought pen! Yes, a process that would inexpensively produce carbon nanotubes of any length would be a key contributor to many future technologies, including a space elevator. However this is not the process you are looking for. This does NOT produce a long nanotube, but with many overlapping nanotubes in it. Unless the individual nanotubes are much, much longer (at least several meters even if bound in a strong matrix), this will be much weaker than continuous nanotubes would be. And for a space elevator we will be able to afford a raveling process much like the rope and cable industry uses. Once we have long enough high-quality nanotubes that the rope has almost the same tensile strength per area as the individual nanotubes, then yes, the rest of the picture you describe is pretty accurate. And THAT will be exciting! Reference lightning. Such a good conductor would also make a very good lightning rod. So put its base in areas of little or no rainfall, like a verrrry parched desert. Another solution is to make the problem a plus by finding a way to utilize said energy. Very good conductors can carry LOTS of energy and the earth is a very good 'ground', so we have the basis for a power plant as well as an elevator. On top of that, if there are usable voltage differentials over relatively small runs of the tether, then induction coils in the climber can harvest power from the tether on the basis of a moving charge passing a 'stationary' object....moving electrons in the tether creating a sympathetic current of electrons in the pickup coils. Use this current to operate the tether motors if possible. Especially effective for braking on descent. Call it 'inductive braking'..heh...heh. If lightning is tooo much of a problem, then put the base on top of a verrrry high mountain, like K2 or Everest. RealScience, please read my post again, all of it. It said basically that by using a kind of 'plotter pen' with a verrrry large reservoir that can be continuously refilled, we can make an individual nano tube arbitrarily long, like say....60,000 miles. By using many in parallel we make the ropes. Existing rope making machines' design can be adapted to create the tether as a continuous process, accumulating the completed cables on a drum that we send to space for deployment. That IS exciting. Your comments were verrrrry clear (well written even). However the pen does not create long nanotubes. It takes an 'ink' containing nanotubes and then orients large numbers of the nanotubes to create a fiber composed of a large number of nano tubes oriented parallel to each other. Note that the article keeps referring to "long nanotube FIBERS" instead of long nanotubes. And the fiber is first drawn in the air so that it can be stretched to better orient the nanotubes. But COULD the ink contain very long nanotubes, or would they simply tangle in the ink? Could the ink contain some catalyst or linker that would JOIN tubes end to end as they are drawn out into a fiber?. The current processes for making very long individual nanotubes produce them oriented parallel to each other, so my bet is that for a space elevator cable we will KEEP the fibers parallel rather than scrambling them in an ink and then drawing them out to re-parallelize them. Once we have a fiber of long-enough tubes that they bind along their length more strongly than their individual strengths (ten meter tubes? ), then the fibers will be almost as strong as continuous tube. And from that point we can start making cables of any length, and some of the science fiction will become start to become reality (still with engineering challenges, but people are great at solving those). Using this, I can see elite Chinese spies drawing up makeshift bomb timers, EMP devices, hacking arrays and snooping devices. "Its just a pen" he said. Might even prove to be a reliable rappelling device or garrote. ... and then comes long woven cables of nearly "perfect" conduction, flexibility and tensile strength ... the repeated bending (or braiding) might be accomplished with multiple rollers ... A worthy goal for sure. Wondering how one would make these cables in manufacturing? Rope making machines? The "find a need and fill it" rule will dominate, no matter the initial costs of manufacture. Cabling can vary from 1/10th of a cent per foot (single strand #20 copper) to hundreds of dollar$ per foot (special tech fiber optic cable) and there could easily be a market for any and all. A nearly "perfect" Carbon nanotube conductor scaled up to carry thousands of volts might exceed costs of several US$ Millions per mile and still be a great deal for the power company, considering power grid line losses of 30% or worse, now.